Laws.com legal form division has announced the launch of DD 2875 form. 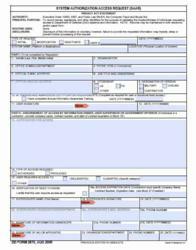 In this month alone, laws.com added three military forms to its list of army forms. Laws.com has already launched DA 31 form and DA 4856; the company said that laws.com working on launching various army forms to make all DA and DD forms available in laws.com Legal forms section. The company already host number of DA forms, and the addition of DD 2875 form will bolster its position as an online resource for free legal forms. The users can freely download the form DD 2875 by visiting laws.com Legal forms section. DD 2875 system authorization access request form is used to request access to Department of Defense computer system. Up on submitting DD 2875 form to the approving authority, they will review the application for granting access to the computer system. Laws.com DD form 2875 comes with the how to fill DA 2875 system authorization access request form video guide. The video guide to fill DD 2875 form is designed has a step by step video guide for filling the DD 2875 form. The video guide helps the user to fill the form by showing an example applicant filling the form. In the example, the video show the filling of DD 2875 form fields with sample data and all that the user has to do is replace the sample data with the user own data to complete the form. To download the form from laws.com, click DD form 2875. The above link will take you to form download page and click the download button to save the DD form 2875 to the computer. Laws.com is the online legal site that offers various legal forms, court dockets, and legal information at free of cost. The site also host large lawyer database, the lawyer database list lawyers across USA and their contact information.